I’ll call him Clark Randall. At 18, he volunteered for the Army. In early 1945, he went through basic training and was sent to Ft. Ord in Monterey to be trained as a diesel mechanic. He barely finished his training before the war ended and he was mustered out. Clark returned home to Bakersfield and got a job in the nearby Taft oil field as an all-around field hand - mechanic, rough neck and rigger, working for Chevron. He became known as an energetic, young man with a secure, though not especially lucrative, future. A year later he married Jo Ellen, his high school sweetheart, and Baby Bob showed up nine months later. Clark did a lot of things well but he was mechanically curious and always ready to learn some new aspect of the oil business, so his boss was glad to assign him to the non-routine jobs that spring up in the field. Replace a boiler, repair a section of pipeline, trouble shoot the pump at #17. Clark worked in Taft for three years but there were many older, more experienced men ahead of him and there wasn't much room for advancement, so he started looking for something better. 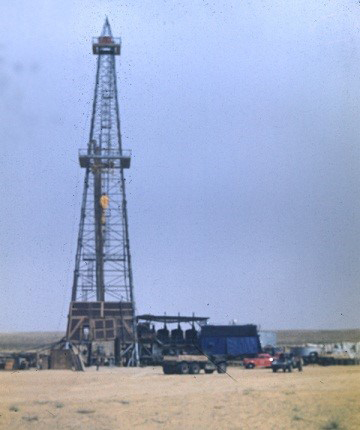 About 1948, Chevron sold one of its surplus rigs to Aramco. The company was desperate to get as many rigs in action as it could, as fast as possible. Randall's boss put him in charge of breaking down the rig and shipping it to Saudi Arabia. Clark considered the task, looked at the rig, found an engineering drawing of the structure, numbered it up into sections and sub-sections and then marked each piece accordingly with yellow paint as the crew disassembled the derrick and power plant. Once everything was packed up, he delivered the annotated diagram and the detailed manifest of each crate and the parts it contained. Clark had never considered Chevron's Arabian venture before but a seed was planted. He asked around and he was quickly hired by Aramco. Not much later he arrived in Abqaiq on a single-status contract for a provisional year before his family could come over. In 1949 things were hopping in the Abqaiq field but when he arrived, as happened often, the personnel people weren't exactly sure where to put him, so he rotated from job to job as a substitute for some sick rigger or a mechanic on short leave. This wasn't bad work but it wasn't getting Clark anywhere as a career, he missed Jo Ellen and Bob and began to consider calling it quits after his year was up. One day between assignments, he was in his supervisor's office and the man was telling him that they had received a rig shipped from the States. It had been mistakenly off-loaded at Karachi, but had finally arrived - only accompanied by the bills of lading, all the other documentation was missing. They had cabled San Francisco for instructions but would Clark run down to Dhahran and check it out. Leaving Abqaiq in his Dodge Power Wagon, Clark speculated about this errant shipment. But by time he passed the decrepit cement-block halfway house on the two-lane blacktop road to Dhahran, it was so hot that he began anticipating a cold beer at the Stag Club when he finished this chore. It was a time when such a thing was legal within camp. 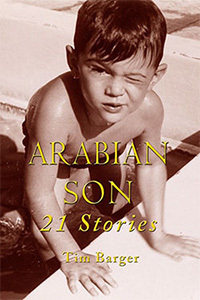 He introduced himself to Fritz, the manager of the break-out yard in Dhahran. They had a cup of coffee, talked shop, and enjoyed the AC for a few minutes. Fritz, an old timer bachelor, was enthusiastic about the Aramcocade, a sort of Esther Williams inspired aquacade, that was going to be staged at the Dhahran Pool. He had visions of mermaids swimming before his eyes. Fritz called in his right hand man Hamood Ali, a short, wiry Qatifi with perfect posture and well used laugh lines around his eyes. Clark liked him right away and was happy to follow him out of the office. At the time Aramco had a small fleet of three-wheeled Italian motorcycles called Apes. Hamood hopped in his Ape, popped the clutch and led Clark on a wild chase though the vast maze of the yard. They drove past lanes of stacked-pipe, great bundles of rebar, huge wooden spools of wire and then Clark turned a corner and screeched to a halt. There was his rig. In his crates. Marked Taft, California. Clark was stunned. And then, in a stroke of divine inspiration, decided not to tell anyone what he knew. He and Hamood opened some of the crates with a crow bar. Clark grinning to himself as he recognized his own code numbers painted in yellow. After a while he drove back to Abqaiq. "All the parts are there and they are in good condition. Tell me where to put it up, give me a crew and it'll be ready in a month," said Clark. His boss who had dozens of new problems every day looked at him and said, "Are you kidding me? It'll take that long to get the paperwork from the States." "Everything is there. The rest is geometry. I've worked on rigs like this one, repaired parts of them. I'll work up a diagram and we'll put it together. No problem. In a month." The boss whose mind was on the enormous Kenworth truck that had just rolled over with a load of pipe somewhere around Shedgum, paused to stare at Clark and finally said, "Okay. You got it. But screw this up and you're on the first plane out of Dhahran." "I would insist on nothing less," said Clark. Eventually the crates and pieces were delivered to somewhere in the desert south of Abqaiq. Three weeks later the rig was ready to go. Clark was golden and he never looked back. It wasn't long before Jo Ellen and Bob joined him. Baby Fred came along a while later. After an illustrious career of more than twenty-five years Clark retired as one of the most respected drilling operations supervisors in the Aramco oil patch.